Higgins is a Chicago-born artist working in clay and multi-media. She received a BFA in art education and ceramics from University of Illinois in Urbana-Champaign in 2008 and did a postbaccalaureate year of study at Louisiana State University in 2010. She has taught visual arts in a variety of settings including Chicago Public Schools, the Archdiocese of Chicago, Marwen, Lillstreet Art Center, and Terra Incognito Studio and Gallery. Higgins has held a resident artist position at Terra Incognito in Oak Park, Illinois for the past two years and currently teaches through Urban Gateways, an organization that provides supplemental arts education programming to youth in the Chicago land area. She has exhibited in several exhibitions including Bowl Me Over the 2009 Lillstreet International Juried Exhibition and Union Street Gallery’s current national juried exhibition, Wanna Play. 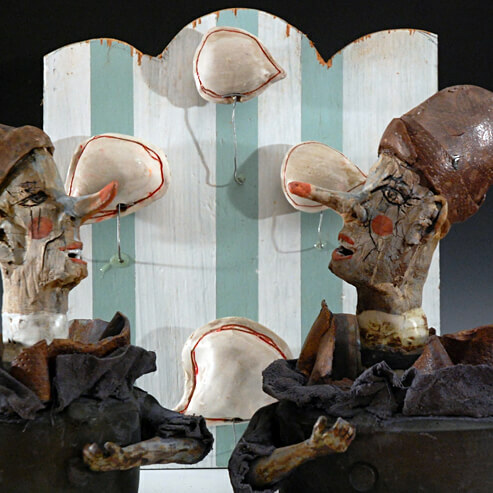 Higgins lives in Chicago and continues to work both functionally and sculpturally in clay. A rusty blue garbage truck, a bolt studded viaduct in peeling green, or a leaning construction horse striped black and yellow triggers memory of worn toys and discarded play storylines from my past. When a shape, color, or smell catches my attention, I file it into a closet within my mind, one cluttered with old junk and beloved objects of the past. As more ephemera accumulate from my lived life, I rummage through this space for pairings of meaning. The work begins when one element finds its partner; another impression that evokes the same resonance. It is through these sensory recollections- comparisons of color, shape, and order that I begin to understand myself. Mining imagery of childhood and other remnants of my history as inspiration, I strive to connect attributes of my childhood identity with those I have come to know as an adult. My work begins with the process of documenting these varied observations. I imagine my viewer drawn to a kinship with each piece as when listening to a love song. Like an old familiar song, perception and associations shift over time, and understanding becomes linked to a specific moment in a person’s life. The work becomes a paired down reinterpretation of my life’s narrative. Beginning with an inkling similar to deja vu, I use my mind and hands as a conduit between present and past with hope that a detail; a crack, a gesture, a color, resonates within the viewer and is perpetuated into their own bank of sensory recollections.